Get ready to meet a new version of jolly ol' Saint Nick. 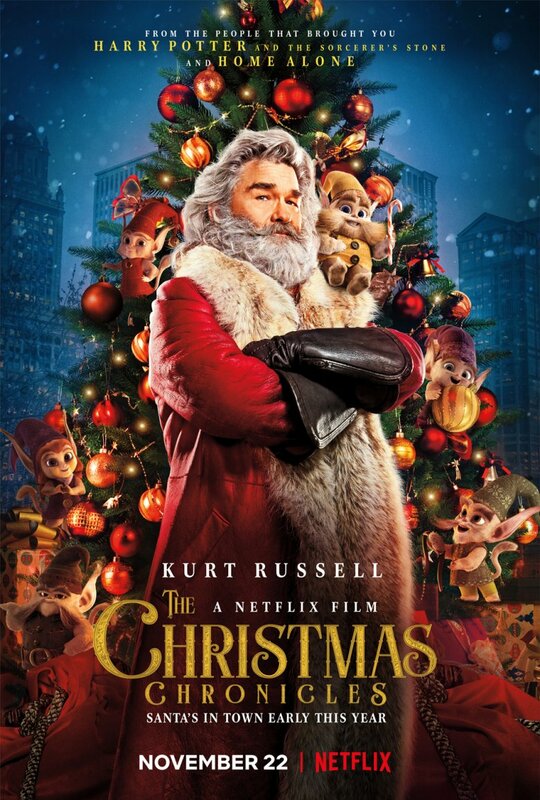 In The Christmas Chronicles, Netflix's upcoming original holiday movie, Kurt Russell stars as a modern, cooler-than-the-North-Pole Santa Claus. Sure, he's still rosy-cheeked, a little soft around the tummy, gray-bearded, and fond of cookies and milk like the Santa of our memory, but Russell's iteration of Kris Kringle is also self-aware, suave, and oh-so confident. Feeling much like the Deadpool of Christmas characters, Russell's Santa breaks the fourth wall and looks directly at the camera when he declares that children "aren't stupid" and understand what goes into deciding whether they land on the naughty list or the nice list. He also jumps from residential rooftop to residential rooftop and slam-dunks neatly wrapped gifts down chimneys, quips that "billboards add 80 pounds" when someone points out that he doesn't really look like the Kris Kringle featured in Christmastime cola ads, and gets behind the wheel of a hot rod to escape the police officers who are chasing after him. The film seems silly and a bit cheesy on the surface, but looking at the pieces of The Christmas Chronicles, it definitely has what it takes to be a smash hit for Netflix. Having an A-lister like Russell top-line a Christmas movie, something he's only ever done once before in the '70s, is sure to draw in viewers — even if just for the initial unbelievability of it all. Additionally, given Russell's experience starring in action movies – Escape from New York, The Thing, and Big Trouble in Little China are amongst his most well-known works, after all — and the fact that The Christmas Chronicles will include plenty of high-octane hijinks, there's essentially no chance that the actor will give a bad performance here. Most importantly, though, it looks like The Christmas Chronicles will offer something new to the Christmas movie landscape. As evidenced by this first-look trailer, the pic will blend a story that's essentially a stretched-out take on the first act of The Santa Clause, with siblings Kate (Big Little Lies' Darby Camp) and Teddy Pierce (Summer of 84's Judah Lewis) helping save Christmas after accidentally crashing Santa's sleigh on Christmas Eve, with a whole bunch of rowdiness and a version of Santa that carries the same fun-loving, thrill-seeking attitude that Billy Bob Thornton's character did in Bad Santa. Every December, audiences are inundated with humdrum Christmas movies whose dialogue goes in one ear and out the other, whose characters are as stale as gingerbread houses that have been sitting out since the day after Thanksgiving, and whose stories are forgotten soon after the credits roll. (Really? Another Christmas film about a prince from some far-off land falling in love with a small-town girl? Puh-lease.) The Christmas Chronicles, with its apparent wackiness and CGI toy-making elves and all, just might be the breath of fresh, frosty air viewers have been hoping for. Directed by Frozen animator Clay Kaytis and co-produced by longtime Harry Potter film franchise producer Chris Columbus, The Christmas Chronicles is due out on Netflix on November 22.